The first Buddhist precept prohibits the intentional, even sanctioned, taking of life. However, capital punishment remains legal, and even increasingly applied, in some culturally Buddhist polities and beyond them. The classical Buddhist norm of unconditional compassion as a counterforce to such punishment thus appears insufficient to oppose it. This paper engages classical Buddhist and Western argument for and against capital punishment, locating a Buddhist refutation of deterrent and Kantian retributivist grounds for it not only in Nāgārjunian appeals to compassion, but also the metaphysical and moral constitution of the agent of lethal crime, and thereby the object of its moral consequences. Buddhist precept (pāṇatipātā) prohibiting lethal harm. respect to the prevention of and retribution for crime. undermines its own rational and normative discourse. In late-2012 the Slovenian philosopher Slavoj Žižek gave a lecture in which he proposed to offer his critique of Buddhism from a Western Marxist perspective. Being Žižek, he talked about everything else as well, but he did articulate something that remains perspicuous. In the face of recent neuroscience investigating the neuronal bases of personal agency and the freedom of the will which, Žižek tentatively claims, increasingly demonstrates that “we are just neuronal machines, our freedom is an illusion, that there is no self, no autonomous agent” he put forward four separate interpretive options which we—presumably choicelessly!—must decide between. The first, which he calls the predominant position among the majority of neuroscientists, is to simply “admit the gap” between our neuro-scientific knowledge, which asserts that “the way our brains are wired evolutionarily, we are condemned to experience ourselves falsely as free, responsible, autonomous agents” and the subjectively felt sense that we really are responsible, free agents. This results in a lived dualism, not uncommon, between what we theoretically know to be the case (for example in particle or quantum physics), and what we experience to be the case. The second position he offers is like the first, except that it tries to give it some dignity by framing it within (in Žižek’s terms) a “Habermasian” humanistic all-inclusiveness whereby insofar as we rationally “know that we are neuronal automata, and that there is no freedom” then our very knowledge of that apparent fact only confirms our free rationality as the scientific endeavour by which we can know what we “really” are, and therefore in some fundamental sense, also transcend it. Žižek is a little doubtful about this, despite his own Hegelian proclivities, but then he is doubtful about what he sees as the entire Habermasian enlightenment project of trying to rescue (Euro-American) humanism from the assaults of science and religion. Žižek takes this seriously, and urges us to as well. He says in “this constellation of the total naturalization of man” that genetics, neuroscience and their technological applications are forcing upon the 21st century consciousness, we have no choice, as thinking beings, than to consider some kind of response within the spectrum he offers. If the neuroscience is accurate, is Žižek, Metzinger, and before them, Buddhism, right also? Can we expect the brave new world of the 21st century to include “meditative self-deconstruction” among its primary civilisational disciplines? The idea is intriguing; I leave it to your own—choiceless—imagination. An interview with Ya Noya (Prague). For Buddhism, the life of any sentient being is considered as irreplaceably valuable. Particularly, the Buddhist First Precept is to refrain from killing any living being; and more generally, ahimsa means to refrain from violence of any kind – of body, speech and mind. However in certain cases the Buddha also appears to take into account other factors and values. Ahimsa is not quite as simple as it might seem, and the Mahāyāna tradition with its aspiration to universal altruism makes the issue of killing more nuanced than simply following a rule: for the Buddha, the motivation or intention behind action is still more significant. At the same time, this factor of “intention” (cetanā) should never be used to justify acts of killing, even though it might help understand them more deeply, when they occur. In this interview Martin Kovan discusses with independent researcher Ya Noya the themes of killing, suicide and self-immolation in Buddhism, considering their theoretical background and manifestations in Theravādan Burma and Mahāyānist Tibet. Melbourne, Singapore – Prague, September 2013 – March 2014. YA NOYA: Martin, you have investigated – already for several years – some ethical issues and their manifestations in Tibetan and Burmese Buddhist contexts, in recent years with a focus on the theory of sanctioned killing and since late 2012, extended by a consideration of religious-political self-immolations in Tibet and the West. Could you make some initial general comparison between these two contexts? You have suggested you are not so focused on anthropology or history; however you observe the current situation and you have spent much time in Western Tibetan Buddhist environments and among exiles from Burma. So let’s make this Q&A as the starting point (to which we can relate later) before we turn more to the consideration of Buddhist ethics and philosophy, which is your main professional focus. MARTIN KOVAN: Yes, sure. I think one of the basic initial distinctions to be made between the Burmese and Tibetan Buddhist cases is that the Theravāda is essentially self-centric with regard to the ultimate goal of Buddhist practice: i.e. personal enlightenment is the primary motivator as well as end of all Buddhist action in this life. For the Tibetan Mahāyāna, on the other hand, the entire focus is directed from the beginning to universal-collective compassion and salvation, or enlightenment. This would potentially explain how not a single Tibetan monastic case exists of religiously motivated lethal violence directed toward the Chinese oppressor, unlike recent Burmese-monastics who have been indirectly implicated in violence against Muslims in the form of hate-speech and racial vilification. The Tibetan Buddhist self-immolations are reflexive not just formally (as suicide) but often morally also: they exhort Tibetans to greater degrees of empowerment, but also selflessness. They do not directly blame or shame the Chinese wrong-doer: if anything they express a wish for the enlightenment (comparatively-speaking) of the invader. That is quite a radical difference from the entire Burmese Buddhist mind-set, which is a compassionate (metta and karuna) but not explicitly universalised one (bodhicitta). And in fact we find that the nationalist Burmese ‘monks’ see themselves as justified in their violence toward the Muslim ‘other’. It is very unlikely Tibetan (Mahāyāna) Buddhists would ever religiously justify violence toward the (Chinese) other because universal compassion rules that out. That does not modify the historical fact that a Tibetan resistance army fought in the 1950s with the blessing of His Holiness the Dalai Lama, and that in this case Tibetan Buddhist identity was willing to endorse armed violence. But that historical contingency does not alter the theoretical case, that willed aggression in Buddhism is not religiously justified (unlike for example Holy War in Christianity and Islam). One could simply say that armed aggression is a pragmatic response that for any Buddhist culture is regrettable. In any case I think it could be claimed today that the Tibetan sense of nationalism is based more on cultural identity (especially as Mahāyāna Buddhists) rather than the political sense of a separate nation as such. Until the invasion of 1959, Tibet wasn’t primarily concerned about its status as a nation-state: its Dalai Lamas were essentially spiritual rulers, rather than heroic, offensively military ones, as we see historically in Burma, Thailand and Sri Lanka, for example. That is, their religious identity is built into their ethnic identity, which is built into their personal-social cultural conditioning. Tibetans aren’t protesting in Tibet because they want to aggrandize their Tibetanness, but because their basic rights as sovereign individuals and as a society, rather than a race, are being abused. For them it is not an ethnic issue per se; for the Burmese Buddhists on the other hand, it is (in fact exclusively) an ethnocentric issue. Burmese religious arguments in support of a Buddhist-homogenous homeland are a pretext; Muslims have been living in Burma for a very long time, with Hindus and Christians, in generally peaceful conditions. Burmese Buddhist nationalism is racial prejudice, no doubt exacerbated by acts of violence committed from both sides. But for someone of the moral stature of Aung San Suu Kyi to suggest in late-2013, after still another year marked by appalling ethnic violence, that the Burmese Buddhist fear is a response to a perceived global Muslim push for supremacy, and to thus indirectly justify the violence, is quite dangerous. Her words, however unintended, potentially give ballast to ethnocentric claims of Burmese Buddhists – the last thing they should feel empowered to maintain in the very critical current circumstances in Rakhine state, as elsewhere in Burma. The misconstrual of the moral imperative, on both sides of this conflict, is doubly unfortunate because it will take a long time, now, for the possibility of any reconciliation, and the last thing the world needs now is another Israel – Palestine. YA NOYA: How much could different geographical conditions, considering the isolated Tibetan plateau, play a role? MARTIN: That’s an interesting question, and some anthropologists are considering it. Certainly Tibet’s vast size, altitude and sheer remoteness from its neighbours (given the Himalayan range) make it isolated from almost anywhere but China. This is of advantage to China, and the officials of the CPC (Communist Party of China) no doubt enjoy the looming threat their occupation of Tibet still represents for India. Burma on the other hand has for centuries been a cultural and religious nexus of Indic, Muslim, Buddhist, Chinese and (not to forget) Anglo-European influence, with a welter of racial convergences included in that: a much more volatile mix. I think the background of geo-cultural and political conditions make a difference to the Burmese and Tibetan cases, respectively, but it would require analysis to more precisely define it. 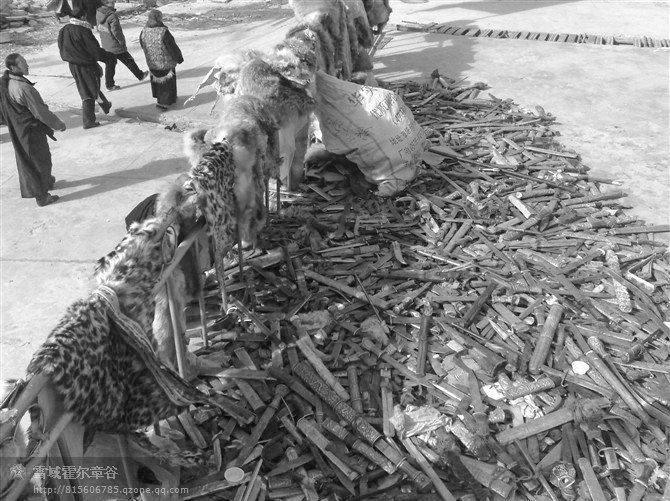 Tibetans hand in knives and wild animals pelts to be destroyed as a gesture of non-violence, eastern Tibet. | Photo: savetibet.org. YA NOYA: As you said, HH Dalai Lama is a religious and monastic leader of Tibet, and though now in “political retirement”, still wields influence. Since 1988 instead of full independence he upholds the so called Middle Way Approach (i.e. originally suzerainty; and since about 2005 only cultural and religious autonomy within China – moreso in the TAR than in the Eastern part where the most fighting took place in the beginning of the Chinese occupation and where the majority of recent self-immolations have occurred). Anyway, the history of Tibet is quite manifold. We can find Tibetan emperors, including the so-called ‘three religious kings’ who were assimilated into the three religious protectors. The specificity of terrain supported the existence of competitors and rivals of the ruler, the fragmentation of Tibet and power; and there were several influential Buddhist lineages active (incl. Sakya, Jonang, Kagyu). The Great Fifth Dalai Lama (17th century) is known for unifying the Tibetan heartland under the control of the Gelug school of Tibetan Buddhism, after defeating the rival Kagyu and Jonang lineages and the secular ruler (the Tsangpa prince) in a prolonged civil war. There is different information about it. According to the 14th HHDL, some monasteries were closed by the Great 5th DL because of supporting the previous ruler, i.e. because of political reasons, but on the other hand he passed laws ensuring the freedom of religion. Burmese kings were not monastic, but considered themselves to be lay Buddhists. They were warriors fighting for their own hegemony or defending their land. We could also mention Burmese junta dictators presenting themselves as Buddhist leaders supported by some senior monks. In recent decades during the time of the junta in Burma some resistance fighters’ army conjoined “Buddhist” and “army” in its title. Their members considered their armed fight as justified, as one said, “fighting with Mara, who embodies delusions”. In eastern Tibet, there lived proud and devoted lay Buddhists, who were also warriors occasionally fighting between clans or protecting people against invaders or bandits. 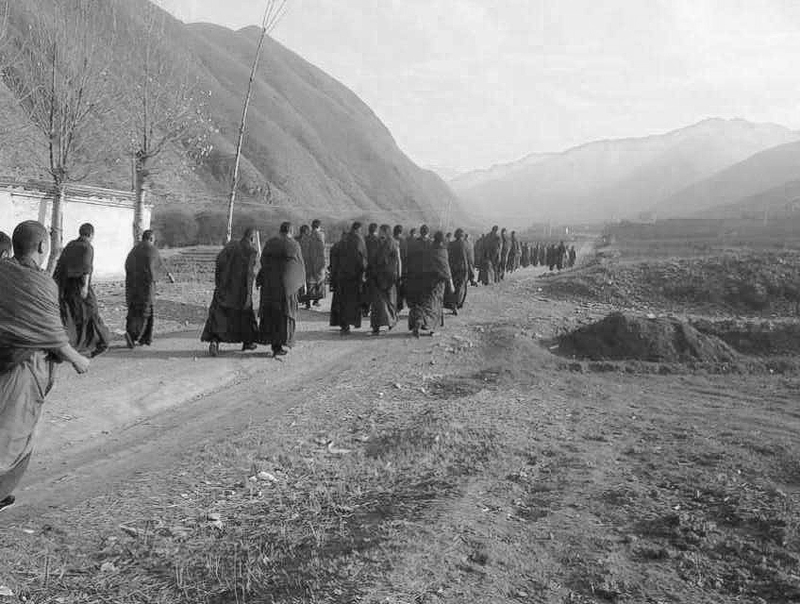 Later they joined together against the Chinese army, and in 1957 in Lhasa established the Tibetan armed resistance Chushi Gangdruk movement (and they organised the ceremony for the long life of HHDL, offering him a golden throne). They controlled the territory of Western Tibet; and heavily fought in eastern Tibet. These warriors were instrumental in the escape of HHDL from Tibet. Despite his beliefs of non-violence, H.H. Dalai Lama (before entering India) paid honour to the Chushi Gangdruk for their fight for his protection and that of the Buddhist nation. There is information, in the time of the resistance, of monks in Tibet also joining the armed fight, when facing real disaster or after the monasteries were destroyed. They disrobed or sometimes even did not, probably because of urgency and lack of time. Monasteries incl. those in Lhasa stocked arms for the Tibetans, they were important centres. However there is also info about earlier fights between powerful monasteries in Lhasa (candidates for the regent, provisional ruler of Tibet), where monks killed each other. Looking at these phenomena just from the view of the fundamental Buddhist commitment not to kill any living being (i.e. The First Precept), one can be confused, surprised or even become disillusioned because of this apparent discrepancy. You have been studying the theme of killing in the Buddhist context for some time, including canonical texts. Do you have some explanation which would help us to get a handle on this issue and avoid that disillusion, more consciously? For example concerning religious texts, I know of “holy fight or war” mentioned in the Hindu Bhagavadgíta (the Kurukshetra War); and in Buddhism, about wrathful (or terrifying) bodhisattvas (deities), and some violent deeds of Milarepa in his youth. MARTIN: The problematic you point to is a large and complex one. Yes, it is textually and normatively the case that the First Buddhist Precept and Eightfold Path proscribing killing (as well as the Vinaya, and Pali commentaries of Buddhaghosa and others) all emphasise the central concern for universal non-violence ie. with regard to human and non-human sentient beings. But this also includes, more deeply, the non-violence of speech, and mental acts: the willed allowance for thoughts of hatred, aggression or violence is for Buddhist psychology no worse in principle than violent acts themselves (however, the thought carried out into an act, accrues worse karma than the thought alone). Having said that, we now need to make two further distinctions: from this 1) ideal normative basis (in the scriptures and centuries of commentaries) of universal non-violence, there is to be distinguished 2) the ways in which real people, native Buddhists who have been a part of the long historical trajectory of ‘Buddhism’ as a religion, have interpreted its norms and put them into practice: in other words, Buddhist cultural anthropology. Starting with Emperor Ashoka, perhaps, you have the archetypal figure of violence redeemed in a true embrace of the dharma: the conquering warlike king who became a peace-loving Buddhist patriarch. And this is interesting because Buddhism is then seen not just as an ideal norm we should automatically live up to, but as intersecting with the existential reality of samsara – the wheel of suffering – or what actually is; and showing that the buddhadharma wins through (at least in this case of Ashoka). Every case is quite unique. Yes, the Burmese regime is ‘Buddhist’ by virtue of cultural identity, but we need to scale that claim to what their actual practice demonstrates. Similarly with the Burmese monk Wirathu and his associates. They are ‘Buddhist’ but only in a weak sense. So you see there is a calibration of scale we need to apply to really see these distinctions in the right proportion. You could represent the ‘Buddhist spectrum’ all the way from the well-known social and political leadership of people like Thich Nhat Hanh, Maha Ghosananda (Cambodia), and A.T. Ariyaratne (in Sri Lanka) to HHDL and Dr. Ambedkar and more recently U Gambira in Burma and then on to leaders like Aung San Suu Kyi (a devout Buddhist, but also, it seems, an ethnocentrically-inclined Burman Buddhist) and then on all the way down to the 969 Buddhist-nationalist extremists who are inciting hatred through racial hate-speech in Burma. Now clearly they are all manifesting within samsara very different grades of Buddhist ethical norms. With regard to the canonical textual record, there is some very interesting scholarship by scholars like Rupert Gethin, Martin Delhey and Stephen Jenkins, that interested people should consult. The very broad picture is that all other-directed violence is proscribed, but that some exception in the Mahāyāna appears to be possible for highly-realised beings, ie. Buddhas and bodhisattvas. Given their apparently superior insight into causation, selflessness and intersubjective karmas, they have some possibility of using violence skilfully (as upaya) when there is simply no other choice given a critical situation. So in those rare, esoteric cases involving Buddhas and bodhisattvas, some rationalisation of compassionate violence is theorised. But it must be recalled that this is NOT normative, and not relevant to unenlightened individuals; there is no such thing in Buddhism as a Holy War, as jihad, or any religiously-sanctioned ‘divine’ aggression (the notion of ‘divine’ is itself not really relevant in non-theist Buddhism). In the example you offer in the Bhagavadgita, the frame there is again not merely ethico-political, but soteriological (ie. regarding religious salvation): Krishna gives Arjuna the advice to fight, because in the Hindu framework of karma and the dharma (also means “duty” in the Hindu Vedic context) of the manifest self in Maya, even fighting a (more or less justified) war can be an access to non-dual, and so ‘divinely’ sanctioned insight. For Hindu non-dual soteriology, the real issue is not with violence per se (in the world of Maya everything is illusion!) it is with not properly doing one’s spiritual and worldly duty. As in many other things, the Buddha challenged many of these notions of the Brahmanic ‘status quo’. I would be careful to subsume Buddhist approaches to the problem of violence into (what we now call) Hindu ones. They are two quite distinct traditions within even ancient Indic civilisation. You also have to remember that in the ancient Indian context, including the Buddhist one, you are dealing with existential categories and possibilities that are foreign to us now, especially in the West. We are attracted to Buddhism because of its general rationality but, despite what I just said, there is still a lot of the old Vedic Indian consciousness mixed into the early Buddhist view (that indeed the Buddha is constantly arguing against: eg. violence to animals in animal-sacrifice, psychological violence in the caste-system, against women, and so on). The Buddha is really a tremendous rebel in that sense, in what he is trying to reject; much as Socrates in Greece in the same period is rejecting blind social prejudices, unsophisticated aggressive argumentation etc. It is precisely Reason that wins out in both Socratic and Buddhist discourse in the end, in roughly the same historical epoch. So, generally, in other words, the Buddhist picture, as elsewhere, is large and complex and not univocal. It is not as if there is simply one rule and everyone should obey it, and if they fail to we should become disillusioned with Buddhism itself: that doesn’t really make sense. It is that the ethical norms of Buddhism are options to raise the standard for humanity at large, and now we see in empirical terms how well (Buddhist) humanity has been able to raise itself and realise the freedom of dharma in this realm of samsara. If there is Buddhist violence, that just shows (sadly) how badly real human beings are keeping the standard, and betraying their own ethical commitments. As for Milarepa and his famous “black magic” acts in his youth when he avenged his family by killing members of another clan, you might also recall that when he later met the dharma his guru Marpa made him build and unbuild hundreds of stone towers for twelve years as mental purification, so they say, for the negative karma of those acts. So just because Milarepa killed in his wayward pre-Buddhist youth does not suggest Buddhism makes allowances for killing – it doesn’t. I think it is well known that the wrathful deities in Tantric Buddhism are symbolic personifications of mental energies intended to defeat the spiritual enemy, namely self-cherishing and ignorance, not to suggest there are idols in Tibetan Buddhism to encourage murderous passion. People who think otherwise are simply uninformed and probably havn’t bothered to make serious enquiries (like the early European colonial explorers who first reached Tibet). There are in fact other, more genuinely serious issues, such as Shugden protector worship that has become politicised and very regrettably led to murders within monastic Tibetan Buddhism. This has been publicised and fiercely debated, which I won’t talk about here. These are largely cultural-anthropological issues, and while important in their own right, can often confuse trying to initially understand the normative claims that underlie Buddhist practice. The two contexts (theoretical and empirical) should be understood separately and not replace the other. Unfortunately in a lot of popular discussion this is just what happens and it leads to a lot of confusion (so that when for example TIME Magazine labels U Wirathu ‘The Face of Buddhist Terror’ a lot of people think there really is some Buddhist theoretical basis for terrorist acts, when in truth there isn’t). YA NOYA: Is killing (including suicide, i.e. killing of oneself) in some cases justified in sayings by the Buddha or in commentaries? I think we also need to be careful here in assuming ethical categories that are not explicit or even implicit in Buddhist thinking: for example, justification and permissibility. A lot of Western Buddhist scholars spend a lot of time trying to work out what is “permissible” in Buddhism and what isn’t. Answering that is very easy: look at the Five (or Ten) Precepts, read the Vinaya texts, and the various rules for institutional behaviour. In general, however, the Buddhist position in a psychological sense is very simple: 1) where the mind is defiled by afflictions, and killing results, it is terrible evidence of samsara. Where the mind is relatively undefiled, killing is less likely to take place, and should also, normatively, be avoided. There is also simply accidental or unintended killing, for which Buddhist ethics generally finds only an instrumental rather than ethical blame. That is, there are certainly ill-effects or negative consequences to any act of killing (by an unenlightened mind) including unintended acts, but these are more or less dependent on the degree of clear intention involved. In Buddhism ethics is determined by moral intention: the desire to inflict pain, blame or suffering; where there is no such intention, such acts are determined by reference to a certain natural causal determinism, in this case that of the degree of suffering involved in their recipients. For example, even enlightened beings accidentally step on ants, but theoretically that does not accrue negative karmic effect for them because their minds are otherwise absolutely undefiled, and have understood selflessness (anattā). And there are also 3) situations, for example in so-called “justified” war (or political contestation that has become violent, as in Egypt, Libya and Syria recently) where a certain righteous element is included in the motivation (not merely justification) for violence: these are all mixed cases. Such righteousness is not purely subjective or emotional: it can be informed by a deep moral impartiality and sense of justice, as in resistance movements all through history, so it is morally complex in that sense. You can have a father in Syria who has deep compassion, who loves his family, who wants a peaceful Syria for his family and people, but who feels that engaged violent combat against the Assad regime is now the only solution. So Buddhist ethics recognises his motivation might be very high, even pure, but his means of achieving it is not so pure, not so high. The only contexts in which killing is, in general, conceivably justifiable are in cases such as euthanasia, protest or religious suicide (such as self-immolation), pre-emptive war, counter-terrorism, or ideological terrorism, and Buddhist ethics has differently explicit things to say about each one, where it has addressed them (many of these issues are still under Buddhist theorisation). Personally, I have come to the conclusion that there is only a single possible justification for the willed killing of a living being. (That is, even that context is negligible.) This is where people (such as those lost at sea or in desert) in an extreme survival context need to kill an animal or a dying or near-dead human companion, in order themselves to survive, and that human companion is willing to be killed purely for that reason. And this is completely contingent on those involved: there is no moral imperative or obligation here. (I don’t think this case is comparable to euthanasia or assisted suicide for reasons I won’t go into here.) Also, religious or protest suicide escapes the category of justification because it is antinomian and supererogatory, respectively, and even if valorisable as an act of transcendental or political profundity, is not thereby justified because of that, if justification implies a form of cognitive closure. (I think that distinction is a subtle but important one.) Otherwise, for me, all killing of a healthy living being is never justified in Buddhist ethics, because all other forms of that kind of intentional killing are fundamentally delusional. (I am speaking most centrally of war combat, terrorism, counter-terrorism, capital punishment, retributive homicide and sanctioned assassination.) If we value things like rational coherence and epistemic integrity, as a self-conscious society, it simply makes no sense to kill for the usual range of reasons that humans find to justify it: they are delusions on the level of cognitive pathology. This was in part Gandhi’s great, enormous civilizational achievement: he demonstrated that you can have a pure motivation (for universal freedom, justice, and equity) that can be expressed without violence, just with the force of truth (satyagraha), and be successful. And we have seen that Gandhi’s ethical revolution has had effect not just in India, but all over the world. Not all these examples are purely Buddhist, but it is interesting that at their heights, Hindu, Buddhist and also Christian ethics converge at this point, so that you can have leaders like Gandhi, HHDL and Martin Luther King all converging in some historical, ethical sense, that is relevant to everybody, and transcendent to religion per se: this could be seen, from a Buddhist perspective, as a ‘world dharma’, a global truth. It is interesting that there are few very well-known examples of a global Muslim or Judaic achievement that joins the others; hopefully many great Muslim imams and Jewish rabbis are patiently working to bring Islamic and Judaic ethics to that high level which exists in their traditions, but unfortunately they are not known by the public at large. Let’s also hope Pope Francis continues to lift the standard of Christian ethics and brings that tradition into the 21st century with a new face. YA NOYA: How are the Buddhist texts and reality conjoined, how do they relate to each other, particularly in terms of suicide and self-immolations? MARTIN: The issue of suicide is very interesting, because it is different from killing as homicide, in ways that are often not recognised, even in academic analyses (my recent ethical-philosophical research has been concerned with this issue). Again, you mention texts. Let’s say a quick word about texts. There are all kinds of (Buddhist) texts, so it’s not as if ‘Buddhist texts’ as such encode an absolute (especially in Buddhism, unlike for eg. theistic religions) authority or truth. They are cultural products, specific to a particular time and place: they are contingent. Texts are, after all, simply a part of ‘reality’, they are not outside it, and in some cases might not have more authority. In early Buddhism there was even a very self-conscious hermeneutic concern about how the really authoritative texts could be identified. And they soon had to admit some texts were philosophically definitive (nitartha) and others less so (neyartha); that the Buddha had taught depending on the ability of his hearers (upaya); that different teachings were legitimately applicable to different kinds of students, etc. So you have this 1) hermeneutic issue that soon becomes a 2) dialectical issue: the value of different teachings is context-dependent. They even suggest that the highest teachings might be detrimental or even dangerous to the student who is unready for them. Logically, that sounds counterintuitive, but we can see how it might be the case. So we have to consider this more 3-dimensional dialectical, shifting model of Buddhist ethics rather than a static one-rule-for-everyone. For a start, there are no ‘rules’ as such, no commandments, as you have in the Judaeo-Christian traditions. Buddhist ethics are heuristic guidelines for different people at different stages of the path. Secondly, different guidelines will apply differently to different people given their specific situation. All of this is relevant to the issue of self-immolations as well (as I discuss in my recent essays). It is clear that for the Vinaya, killing (of others) is proscribed, but suicide is equivocal. The Buddha condemned the mass-suicide of monks (before he taught the Satipatthana Sutta about meditation and mindfulness). On the other hand he seems to have excused some old and very sick monk-yogis like Channa and Vakkali who decide to take their own lives: he speaks about them as enlightened arhats, so he explicitly declares (because they have achieved Nibbana) they are not to be censured. So then the textual commentaries argue about these two positions; and contemporary scholars as well. I accept both positions as relevant to the discussion, and again, I don’t think the ‘permissibility’ of suicide is an ethical category relevant to the case. Doesn’t it sound a bit absurd to have an ethical teaching that says ‘Yes, sure, it’s OK to suicide, go ahead!’ Also, ‘non-permissability’ is odd here, as if there should be a moral law against suicide. There are many things in human life that occur in which many of our normative or common-sense categories are not completely relevant. Of course it is, like homicide, regrettable when someone suicides, because it implies great suffering, but it isn’t something to be morally condemned; rather, at least, understood. You then need to look at the actual context, the reasons, and above all, the motivation. HHDL continues to reiterate this issue of cetanā (intention) that is so central to Buddhist psychology. It is not only the kind of act itself that is of first importance, but the quality, motivation and complex of mental factors that determine it. So Buddhist ethics goes a bit deeper than mere judgement of an act per se; it wants to understand what constitutes the act, what makes the act fully what it is, not just how it appears to us externally. YA NOYA: Is there any difference between Buddhist Theravāda and Mahāyāna texts, concerning killing and suicide? MARTIN: Yes, there is. The Theravāda is generally consistent in its proscribing of all acts of violence, in the Pali suttas, and in the Vinaya (code for monks and nuns). However, the Pali suttas, and their later commentaries, also include stories (such as that of Channa and Vakkali mentioned above) that seem to undermine the univocity of Theravāda ethics. In the Mahāyāna the ambiguity is much stronger, because you have the advent of the Buddhas and bodhisattvas who are active in samsara, which means they have to play by samsara’s rules of the game, even where their motivation, and understanding of cause and effect, changes the deeper structure of those rules. There are multiple ontological levels going on at any one time or event: the 1) social dimension, where norms and ethical principles apply (indeed these are intrinsically social categories); then you also have the level of 2) individual, personal psychology, where norms still apply, but where motivation is very significant; then you have a dimension of 3) comparatively impersonal dharmic processes where events are occurring due to defiled elements of mind, motivation and personal-collective karma, irrespective of the personal will. So there are differently calibrated discourses that apply to each of these levels. A lot of this theory is only implicit in Buddhist texts, and needs to be researched much more deeply. YA NOYA: Channa was considered by the Buddha someone who “will not be born again”, as an arhat. An arhat is free from desire, hate or fear, and ignorance. As Keown mentions, from the point of view of early Buddhism, the suicide of an arhat can mean that he has completed what had to, so then can leave life. Such action will not produce any further consequences (compared to the action of someone with deluded mind). On the other hand, the altruistic actions informed by the bodhicitta of the bodhisattva can generate positive consequences, right? Or are these two examples so different that they are not well comparable; because of the different (Theravāda and Mahāyāna) concepts they relate to? On the other hand, the motivation of the bodhisattva is already, from the beginning of the Mahāyāna path, based on universal altruism – a compassion for all sentient and even non-sentient beings (such as plants and insects). The major revolution of thinking in the Mahayana is that instead of being focussed solely on individual salvation, universal altruism becomes a means not only to reduce the unnecessary suffering of other beings, but also more importantly help them “on the way” to achieve their own insight. The bodhisattva achieves a level of compassionate wisdom (bodhicitta, which includes the apprehension of emptiness) that can much more effectively do that than even the Arhat with his/her high attainment. That is quite a radical difference and introduces a whole new ethic into Buddhism: and as we have said earlier, we can see those differences played out socially, politically, even nationally, between Theravada and Mahayana countries, such as Burma and Tibet. YA NOYA: In your essay, when studying the difference between suicide and killing others, you mention the Western approach which usually looks at these things objectively i.e. “what happened” (here a body was killled), instead of subjectively, i.e. exploring state of mind and motivation. You suggest, in the Buddhist approach, especially in case of suicide, the subjective view is apparently more stressed or even considered as decisive, compared to the Western one. Anyway, you suggest four main factors (dimensions) interacting in an act of political or protest suicide; and it seems a potentially very helpful concept for comprehension and any redemptive or liberation process. Would you briefly mention for readers these general dimensions and then consider their (general) potential for redemption or finding solutions? MARTIN: In Buddhist metaphysics every event is causally linked to any number of related or proximal events or causes and conditions. So in a recent essay I suggest that with regard to self-immolation, or protest suicide, at least four dialectical elements are involved that have to be all taken into consideration, rather than simply one (eg. ‘is suicide itself, bad or good or whatever?’) which is what people tend to do when this kind of event occur. My view is that value-judgments around sacrificial phenomena are neither inherent with reference to the acts as such, nor to their interpretation, but occupy a dynamic middle ground as a dependent-arising among the suicidal agent (the actor), the act itself, its ethical witness, and the social polity. These factors are potential conductors of redemptive social-spiritual transformation; and society either engages them, or fails to engage. If we aspire to understand such phenomena, we cannot look at any of these four separately. All these factors together are conductors of redemptive social-spiritual transformation; and the society either engages them, or fails to. As a society, anything is possible depending where our priorities lie. We can be galvanized and even inspired by such events, or we can ignore them and just maintain the status quo. It is up to us, finally. I am not judging the outcome in any absolute sense, except to point to what kind of relation to suffering (collectively or personally) it leaves us in. If the suicides of 127+1 Tibetan Buddhists can inspire some deeper reflection, and action, on the specific conditions of suffering, that seems to me very profound. If it can’t, it is still profound, even if only to demonstrate how oblivious we can also be to the fact of suffering in a larger sense. YA NOYA: In your piece about intentional killing you explain there are some fallacious assumptions, regarding what killers (as agents of killing) assume when they kill and what the reality is; and also why such killing cannot fulfil their expectations. Would you explain these phenomena? MARTIN: I will briefly say that my research focuses on how the metaphysical constitution of mind and body is deeply misunderstood in the act of killing. Killing is not wrong purely because we feel morally bad about it. We feel bad about it because it instantiates a fundamental cognitive misapprehension of our metaphysical structure. In acts of killing humans try to get at dimensions of the person, that are not ontologically accessible through the body. The body is an abused proxy, a substitute, for functions that are not actually physical. It is what in analytic philosophy is called a “category mistake,” in this case a particularly sad existential, not just semantic, one. I have a little slogan I like to use: “You can kill 10 million mosquitoes, but you can’t thereby eradicate that which in a single mosquito you are averse to.” All you can do is kill mosquitoes, but the problem is not solved. Similarly, you can kill ten thousand terrorists, but that will not make an iota of difference to the dimension of the terrorist that you are averse to. That will require other means, which is where Buddhist metaphysics (and ethics) comes in. 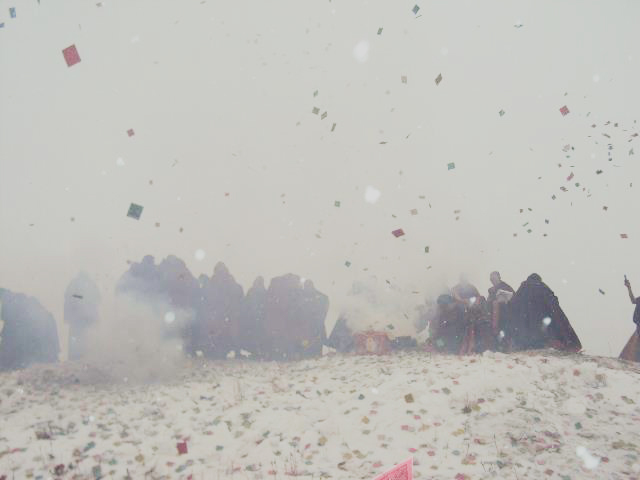 Tibetan monks commemorate the Tibetan Uprising with peaceful religious rituals. | Photo: savetibet.org . YA NOYA: In your recent essays, what do you mean by non-dual in relation to altruistic self-immolations? And how does it relate to, or what difference is there, if any, compared with dependent arising? And there is a psycho-ethical side to this: when you realise that your feeling of ‘me’ or your built-up, egoic self is a kind of cognitive illusion, then you realise that all others are you, just as you are all others. This is ontology, fundamental metaphysics, the Buddha’s central proposition, of anatta: that there is no intrinsic self of any kind. It literally doesn’t make sense to act purely for yourself, because ‘yourself’ is a relative illusion. Santideva makes this central in his text Bodhicaryavatara. It is ironic that in war, itself, we actually recognise this insofar as soldiers are willing to go out and die for others: war is not purely bad, it is actually quite paradoxical. Humans fight wars because they value their particular collectivity; but they value the collectivity because they realise, in some subliminal sense, that everyone is everyone else. This is the implicit metaphysics of war and conflict: that we only fight because we actually value the whole of who we are, rather than the mere ‘me’. That makes sense: if we were concerned purely about ‘myself’ we wouldn’t bother fighting, we would just run away into the forest or the mountains to look after ourselves (maybe with one or two good friends)! And in fact this recognition becomes explicit in the Mahāyāna: act on behalf of the whole, not as a means but as an end in itself (as Kant said). Every being seeks happiness, just as you do; and an altruistic act is such that all beings achieve the same happiness, and not suffering. And the self-immolations in Tibet, and elsewhere, recognise that universal call. They make a very great gesture of self-sacrifice in recognition of that understanding, with the goal that others may understand it also, and see that all beings seek happiness. They are willing to sacrifice their own happiness, like many religious martyrs through history, in order to serve that of others. But in that service they find great fulfilment and achievement as well. Let’s recall that many Tibetan self-immolators have expressed great pride and honour in their act (read the testimonies of Lama Sobha, and many others). We in the West don’t seem to have that same sense of honour anymore, despite exceptions such as Jan Palach and others. Can anyone imagine someone self-immolating in Prague today, or London, or New York? Not likely. So naturally in the West, as usual, we project our cultural norms on other cultures and believe we know best. But maybe we don’t. Perhaps (regarding our dealings with the CPC especially) we need to learn something that these Tibetan martyrs have to teach us, that we have culturally forgotten in our great capitalist amnesia of comfort and self-entitlement. YA NOYA: Are the virtues of the bodhisattva purely her intrinsic ones, or is his behaviour a matter of response to an environment and its current conditions? Does a bodhisattva somehow depend on others, i.e. does she attain the state of bodhisattva contingently through them? MARTIN: This is a quite esoteric question of Mahayanist theory. From what I’ve said already, all beings identifiable in this manifest realm are dependent-arisings, without exception. Concrete, and abstract objects, such as values, all exist in dependence on other things. Virtues don’t really make sense sitting alone in a void, do they? So yes, bodhisattvic virtues functionally require the contexts and real-life situations in order to be virtuously enacted (they need also this dimension of active enablement, they are wasted if they remain only potential). That is the whole point of the bodhisattva, that she refers her acts to this suffering realm of samsara. The meaning is mutually-defining: suffering is salved by great wisdom-compassion; great wisdom-compassion (the bodhisattva’s bodhicitta) is exercised on suffering. As the Heart Sutra says: emptiness is form, form is emptiness. To exercise that understanding is to become a bodhisattva; to fully understand that reality is to be a Buddha. YA NOYA: This might be a sensitive question, because we are neither Burmese nor Tibetans. With respect to them I would ask, have you noticed among Tibetans or others that they would discuss karma in the context of the problems in Tibet, or Burma? In a document about his life, the great Tibetan master Dilgo Khyentse Rinpoche is quoted as saying: “A beautiful country is a dream-like illusion it’s senseless to cling to it. Unless the inner forces of negative emotions are conquered, strife against outer enemies will never end.” I assume he said that when already in exile. Have you noticed this approach in the Tibetan diaspora; i.e. awareness of the inner forces of suffering? What is your view about it? MARTIN: The quote from Dilgo Khyentse is interesting, and it points to some of the deep metaphysical tension that Tibetan Buddhism faces in lived-life: you can say a country is a ‘dream-like illusion’ (and I agree with him) but what do you do when your neighbours invade it? Is the invasion also a dream-like illusion, or do you have to do something about it? What would Dilgo Khyentse do if he saw Chinese troops in 1950 attacking Tibetan villages, or his own family? Would he fight that “illusion” or would he just smile at it? If he fought, how would he fight? How would he decide what he would do and what he wouldn’t do? And so on. At this point Buddhist values and metaphysics hit the rockface of sheer samsara and the outcomes are very spontaneous and authentic, and probably, quite diverse. Personally, I haven’t come across much explicit discussion of karma or testimony from Tibetans regarding the situation of Tibet, though obviously karma is central to the Tibetan, and Burmese, mind-set generally. However, it is important to distinguish the social-political issues from metaphysical ones. So for example, karma might be the Buddhist-metaphysical explanation for all (or a specific form) of suffering, but that doesn’t invalidate the wish for social-religious-cultural autonomy that Tibetans deserve. That is, a metaphysical explanation does not necessarily modify an ethical-political issue; it just adds a new layer of explanation that might or might not be relevant. Sometimes a metaphysical perspective just confuses things, makes it worse; sometimes it can be genuinely helpful. It depends on the context. We could say a lot more about that, but again, that would take us away from the central issues and why they are important. I am interested in discussing ethical-philosophical issues in open dialogue with all and any interlocutors, including non-Buddhists, in terms that are both nuanced and context-sensitive but also more than academic, and not already religious. I believe it is entirely possible (and preferable) to think and reason in Buddhist-ethical terms without having to rely in a strong sense on a belief in karma theory. YA NOYA: In your essay you also study the attitudes in society in which we generally have a tendency to run away from, or destroy, the real problem, “kill it”, instead of facing it constructively. Above you shared your view on the social and Buddhist environment in Burma. Recently we hear a lot about the Buddhist monk Wirathu and the 969 movement spreading quite extremist attitudes, instigating fear of Islam. How do you look at it, concerning the topics we have focused on? MARTIN: The 969 Buddhist movement is a social, ethnocentric and religious phenomenon instigated by a minority of ethnically Burman Buddhist monks, encouraging exclusive trade and social relations between Burman Buddhists within Burma, which ostracizes Muslim business and social groups. However disingenuous, it claims in fact not to be violently or extremist anti-Muslim, just pro-Buddhist. It is an ostensibly political-religious movement that also carries unacceptable overtones (more or less explicit, though these are denied) of racist intolerance and prejudice. Obviously the extreme violence between Buddhists and Muslims in Rakhine State and central Burma (Meiktila) and other regional centres (even in the far north) in 2012 – 2013 are proof of the worst of these exclusionary policies. The worst victims are the Muslim Rohingya who are even denied Burmese citizenship, so that while other Burmese Muslims have some legal protection, the Rohingya don’t even have that, and have therefore been scapegoated in terms that risk genocidal conditions into the future. YA NOYA: In the autumn, the Buddhist council in Burma issued a directive “banning the formation of 969-based monks’ networks and prohibiting use of the movement’s emblem as a symbol for Buddhism”. On the other hand, the extremist monks were not disrobed; no action towards them was suggested. Would you like to make any comment? MARTIN: In a sense it is a healthy compromise: the government via the Buddhist council is expressing some strong disfavour of Buddhist extremism, which will palliate Western concerns, but at the same time maintaining the status quo by not seriously addressing the ‘heresy’ of so-called “Buddhist” extremism. It is a replay of the usual government strategy: give enough concessions to avoid critical scrutiny, but do it in an only a semi-serious way. In fact, in recent weeks this fear has again been confirmed in the brutal murder on January 14th, 2014, of at least 48 Rohingya men, women and children by local Buddhists in a village in Arakan state. Reports confirm that U Wirathu very recently travelled to this same village to teach Buddhists that they were justified in being “sons of the soil” and could drive out the Muslim usurper. I believe it is time for Wirathu to be formally disrobed from the Theravāda monastic institution: he does not represent authentic Buddhist values in a way that can still qualify him as “Buddhist.” Just because someone wears a robe doesn’t mean they are who they say they are, and he has been hiding behind the purity of the robe to push divisive and destructive social agendas for far too long. For now, thank you for your sharing, time and patience. In China and Tibet, and under the gaze of the global media, the four-year period from February 2009 to February 2013 saw the self-immolations of at least 110 Tibetan Buddhist monks, nuns and lay-people. Underlying the phenomenon of Buddhist self-immolation is a real and interpretive ambiguity between personal, religious, altruistic and political suicide, and political suicide within the Buddhist saṅgha specifically, itself reflected in the varying historical assessments of the practice and currently given by global Buddhist leaders such as His Holiness the 14th Dalai Lama and the Vietnamese monk and activist Thích Nhất Hạnh. Part One of this essay surveys the textual and theoretical background to the canonical record and commentarial reception of suicide in Pāli Buddhist texts, and the background to self-immolation in the Mahāyāna, and considers how the current Tibetan Buddhist self-immolations relate ethically to that textual tradition. This forms the basis for, in Part Two, understanding them as altruistic-political acts in the global repertoire of contention.